This week’s Onepager is like music to our ears! 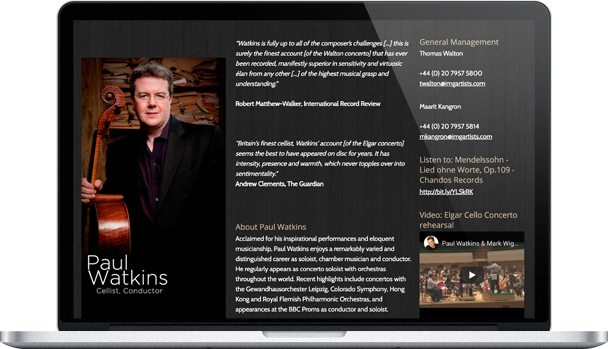 Paul Watkins is a cellist and conductor based in Great Britain. The mood of Paul’s page is reflective of his music: elegant and warm. The white font on the deep grey background, alongside a photo of the musician and his instrument, gives the site a clean, modern aesthetic, that highlights his style as well as his skill. Organized neatly in three panels, visitors can clearly see excerpts from publications, positively reviewing his composition and musicianship, before flowing into more detail about Paul Watkins himself. His artist profile chronicles his globally successful career that has reached from Colorado, to Leipzig, to Hong Kong, over the last two decades. Beneath his bio, Paul has included a slideshow of professional photos for readers to click through. He has casually slipped in a photo of him rubbing elbows with Prince Charles backstage at one of his concerts, just in case you had any doubts about his talent or scope as a renowned cellist. Beneath the slideshow, the reader is directed to links, where they can listen and learn more about Paul’s music and achievements. Paul makes excellent use of the embed and form features in his Onepager, which is a major key. In the right panel, anyone looking to reach Paul can find how to contact his management directly for press and bookings. You can also watch videos of Paul’s amazing cello concerto performances directly on the site or open them in a new tab or window to watch later. Just beneath the videos readers who are interested will notice the simple form where they can subscribe to his newsletter, or keep up with Paul across most social media platforms. Congratulations Paul, on a Onepager that hits all of the right notes!